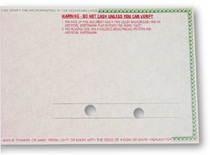 Paper which has been engineered to include several security features BASKETWEAVE PATTERN, A distinctive weave pattern may be printed on the back of the paper by the papermill. This deters "cut and paste" attempts and washes out if bleach is applied. CHEMICAL VOID, Six language void stain guards against use of chlorine-based eradicators (bleach) on the front of a document. FLUORESCENT FIBERS, Invisible fibers, integrated into the paper, are detectable under black (UV) light and can’t be reproduced on copiers. SOLVENT DYE, Alteration attempts with solvent-based ink eradicators cause black or blue stains to appear - a security feature meeting U.S. Treasury specifications. RECYCLED SYMBOL, A artificial watermark that is part of the safety pattern on the back. Unique fourdrinier true watermark paper, A true watermark paper is considered one of the highest levels of document security available. True Fourdrinier Watermark is part of the paper, created during the milling process. Visually, it appears and may be viewed in the paper by holding it up to a light source, much the same as a fine piece of letterhead. Additional security is derived due to the uniqueness of the actual mark, which limits and controls its availability. However, until recently its higher cost had generally made it prohibitive, which is why we had long endorsed the use of an artificial watermark as an economical deterrent against fraud. ARTIFICIAL WATERMARK FLUORESCENT PATTERN, A copier/scanner resistant artificial watermark that is printed like an ink and is visible on face and back at a 45 degree angle for immediate verification and provides additional authentication under (UV) light. Back (standard with safety paper) and/or Face (option). Marking with a highlighter or rubbing with a coin also may verify it. Provides excellent original document authenticity. Unfortunately, because artificial watermarks may now be easily printed and stocks containing it are now readily available at retail stores and over the Internet, the criminals are now counterfeiting versions of this paper. The really great news for you is that because of our security paper volume, we are able to offer this to you at the same price as our artificial watermark. Therefore, effective immediately we will be replacing the standard Ghost artificial watermark paper with a unique fourdrinier true watermark paper. COLORED INKS The use of colored inks raises the level of photocopy difficulty, as a colored copier would be necessary. The use of two (2) inks at offers even greater difficulty when the inks are blended and stretch a copiers ability if at opposite ends of the color band. SECURITY PANTOGRAPH A background screen that conveys a hidden message, usually the word "VOID" when photocopied. The performance of this feature varies due to copier optics and contrast adjustment capabilities.